If you’re American and want to rule the world, get to work immediately. By McCoy’s (History/Univ. of Wisconsin; Policing America's Empire: The United States, the Philippines, and the Rise of the Surveillance State, 2009, etc.) reckoning, you’ve only got a few years left. The so-called American century has run longer than 100 years. It began, the author argues, in 1898, when the U.S. assumed colonial territories formerly controlled by Spain, Puerto Rico, Cuba, Guam, and the Philippines. It extended throughout the industrialized 20th century and the Cold War but then faltered in the “bid to extend that hegemony deep into the twenty-first century through a fusion of cyberwar, space warfare, trade pacts, and military alliances.” Considering that the current occupant of the White House has repudiated such pacts and alliances, it would seem that there are plenty of hard-power options left in terms of sheer military might, but that doesn’t get the job done alone. That repudiation, however, is not unnatural. 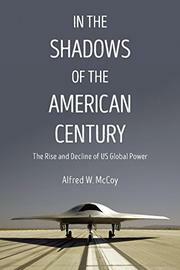 For as long as America has had an empire—and McCoy does not shy from calling it that—there has been an uneasiness, a “profound, persistent ambiguity” about whether a putatively democratic republic ought to be controlling distant countries, whether militarily or through soft-power paths. Meanwhile, our position abroad has been weakened by numerous missteps, as when, in one of the author’s examples, the troop surge in Afghanistan had the unintended consequence of alienating country people and pushing them into the arms of a now-resurgent Taliban. McCoy closes with several scenarios for how American hegemony and superpower dominance will fade—and, he urges, “every significant trend points toward a striking decline in American global power by 2030.” The likeliest beneficiary would be China, he adds, which makes war a near inevitability. If only a dozen or so years are left, then it’s time to start preparing for a post-imperial world—which is unlikely to happen, given the present “inward looking” leadership. Sobering reading for geopolitics mavens and Risk aficionados alike, offering no likely path beyond decline and fall.